Organic Sacha Inchi (Seed Protein), Organic Prebiotic Fiber (From Tapioca), Organic Sunflower Butter, Organic Cinnamon, Organic Raisins, Monk Fruit (Lou Han Gou Extract). Organic Pumpkin Seed Protein, Organic Digestive Resistant Tapioca Prebiotic Fiber, Organic Sunflower Butter, Organic Unrefined Virgin Coconut Oil, Lou Han Gou (Monk Fruit)., Cinnamon Leaf Oil. 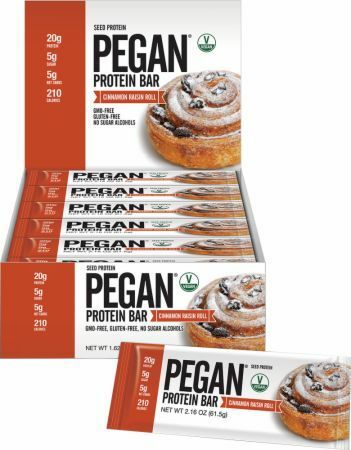 Our signature 100% Pegan protein bars are a great addition to your training diet or as an on-the-go snack. The seed based protein bars are Vegan, low-carb, high-fiber, high-protein (20g Protein), GMO-free, grain-free, gluten-free and sugar alcohol-free. Lab-tested by an independent, third-party institution for quality and nutritional accuracy, and packed with great flavor! Offered in two delicious flavors - Ginger Snap Cookie and Cinnamon Raisin Roll.